Addleshaw Goddard today (31 May) became one of the first major UK law firms to announce its 2012/13 financial results, confirming that revenue has dipped by 2% to £167m against its previous financial year. The top 25 UK law firm saw profits per equity (PEP) partner edge up 2% to £457,000. Despite the generally subdued outlook and weak demand in the UK market the performance will be viewed as disappointing for Addleshaws, which has struggled to achieve sustained growth over the last five years. Addleshaws’ managing partner Paul Devitt said: ‘Of course, we would have liked to have seen income growth for the year alongside the improved PEP and margin and so, in that sense, we’re disappointed. Nevertheless, after a slow first half to the year, it was good to see some growth in the second half. The few financial results that have yet emerged for 2012/13 have so far shown widely diverging fortunes with Mishcon de Reya and property boutique Forsters both announcing double-digit percentage revenue growth. However, many advisers are struggling to expand given the sustained downturn in Western economies. Addleshaws has been moving to re-position itself over the last two years, with the 700-lawyer firm recently abandoning its UK focus to invest heavily in forging an international network. The firm launched five new offices over the last financial year in Dubai, Hong Kong, Oman, Qatar and Singapore and has made nine lateral partner recruits over the year. Legal Business revealed earlier in the year that Addleshaws had held abortive merger discussions with Nabarro. The firm highlighted instructions for Admiral Taverns on a £200m acquisition, a £750m PFI mandate for BDR Waste and a £135m equity capital markets deal for Clinigen Group as key work over the 12-month period. Addleshaw Goddard real estate partner Paula Dillon is to join newly merged Bond Dickinson in its first post-merger hire. Dillon, who was recruited by legacy Dickinson Dees before its merger with Bond Pearce, will join the Leeds office next month. The merger goes live on 1 May. Dillon is well regarded for all aspects of property development, investment and development-related secured lending. She is moving across from the Leeds arm of Addleshaw Goddard, where she was a partner for 14 years. Speaking of her appointment, Dillon said: ‘I am excited by the opportunity to use my market knowledge and contacts to play a major part in the development of a high quality full-service offering in Yorkshire and to further develop the excellent platform that Dickinson Dees has already established. Dillon’s appointment follows on from that of real estate partner and former head of Pinsent Masons Leeds office, Mark Owen, who joined Dickinson Dees last year. In recent months, Dickinson Dees has recruited five other partners into its Yorkshire office: corporate banking lawyer John Connor, insolvency and restructuring lawyer Andy Stirk, corporate lawyer Shiv Sibal and litigator Nick Mason. Addleshaw Goddard and Nabarro have confirmed that they were in merger talks at the start of the year but the former is understood to have called the talks off. In separate statements released by both firms, Addleshaws and Nabarro said that discussions would not progress any further. It is thought that Addleshaws decided that there weren’t sufficient business interests for the firm to merge with Nabarro. One former Nabarro partner said the talks were being held before Christmas, with the firms exchanging financial information, although both firms declined to comment on this point. One particularly interesting statistic emerged from our in-house survey last month: 33% of respondents said they felt law firms were not handling their work at the appropriate level. And the biggest losers in all of this? The senior associates. In Hermès on Sloane Street on Friday 5 October 2007 Roman Abramovich, the billionaire owner of Chelsea Football Club, is enjoying a quiet afternoon shopping. Two doors down in Dolce & Gabbana, his former business partner is also indulging in a little retail therapy. In better days the two would visit each other’s superyachts and holiday together. But by 2007 the relationship had soured, and Berezovsky was itching to issue a writ suing his former friend for $6.5bn. 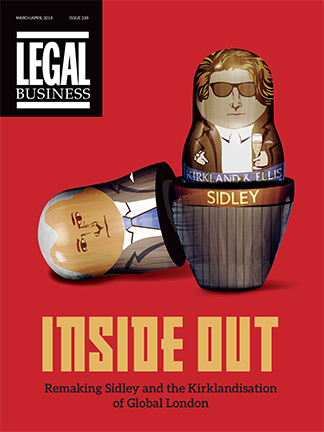 Three litigation partners left Addleshaw Goddard last year to set up a conflicts-free, disputes-only boutique. LB finds out how well the model is working. For many, it’s a depressingly familiar scenario. You’re an experienced litigation partner handling financial services and contentious civil fraud disputes, advising corporates, entrepreneurs and high-net-worth individuals. A senior in-house lawyer from a bank asks you to represent them against another major financial institution after being given your name by a partner from a rival firm. A conflict check then reveals a banking partner at your firm had dinner with the other side and anticipates some corporate work in the pipeline. You have no choice but to decline the instruction.